In 1964, Ken Boyer showed the qualities one would expect in a Hall of Fame player. The Cardinals third baseman consistently excelled with the glove and with the bat. He was a champion and a leader. He achieved feats that ranked him among the elite at his position all-time. Boyer still hasn’t been elected to the National Baseball Hall of Fame at Cooperstown, N.Y. The only other third basemen of the 1958-64 era who fielded and hit at the same level as Boyer were Brooks Robinson of the Orioles, Eddie Mathews of the Braves and Ron Santo of the Cubs. All three have been elected to the Hall of Fame. Though one outstanding year doesn’t qualify anyone for the Hall of Fame, Boyer’s 1964 season is important because it caps a seven-year stretch of consistently high quality and puts into context how Boyer elevated himself into a special category of third basemen. Boyer, 33, played in all 162 Cardinals regular-season games in 1964. He led the major leagues in RBI with 119. Boyer also ranked in the top five in the National League in triples (10) and walks (70). He hit .295 with 185 hits, 30 doubles and 24 home runs. He scored 100 runs. His on-base percentage was .365. Among NL third basemen in 1964, Boyer ranked second in both assists and double plays turned. His immense value to the Cardinals was proven with these statistics: Boyer hit .335 with 91 RBI in the Cardinals’ 93 wins in 1964; .238 with 28 RBI in the Cardinals’ 69 losses. Remarkably consistent, Boyer in 1964 hit .296 against right-handed pitching; .291 versus left-handers. Boyer was at his best against the Cardinals’ closest competitors, the Phillies and the Reds. Each finished a game behind the pennant-winning Cardinals. Boyer hit .351 with 17 RBI in 18 games against the 1964 Phillies; .309 with 13 RBI in 18 games versus the 1964 Reds. _ He was named recipient of the NL Most Valuable Player Award on Nov. 24. Boyer became only the second NL third baseman and just the fourth in the big leagues to win a MVP Award. The others were Bob Elliott of the 1947 Braves in the NL and Al Rosen of the 1953 Indians and Brooks Robinson of the 1964 Orioles in the American League. 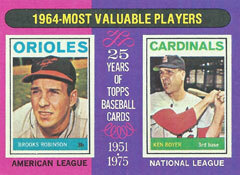 The top five in balloting for 1964 NL MVP were Boyer, Johnny Callison of the Phillies, Bill White of the Cardinals, Frank Robinson of the Reds and Joe Torre of the Braves. Boyer received 14 of 20 first-place votes. _ The Sporting News named Boyer its Major League Player of the Year. He became the third Cardinals player to earn the honor, joining Marty Marion (1944) and Stan Musial (1946 and 1951). _ For exemplifying the qualities of Lou Gehrig on and off the field, Boyer was presented the Lou Gehrig Memorial Award by the late Yankees first baseman’s Phi Delta Theta fraternity at Columbia University. He joined Musial (1957) as the second Cardinals player to receive the honor. _ He became the first third baseman to lead the NL in RBI since Heinie Zimmerman (102) of the 1917 Giants. Boyer also was the first Cardinals player to lead the major leagues in RBI since Enos Slaughter (130) in 1946 and the first Cardinals player to lead the NL in RBI since Musial (109) in 1956. _ The 1964 season was the last of seven in a row in which Boyer hit 23 or more home runs and produced 90 or more RBI.